Hadithi crafts is a collection of traditional and contemporary handwoven baskets. The extensive gamma was produced by more than 30 women’s groups in the Kasigau corridor in Kenya, each of them counting on average 15 members. The groups are organized as co-operatives of weavers. This region is of the utmost importance for the maintenance of the nature and the wild animals because it is the connection between the East and the West Tsavo National Park. Weaving baskets is a tradition in Taita culture. 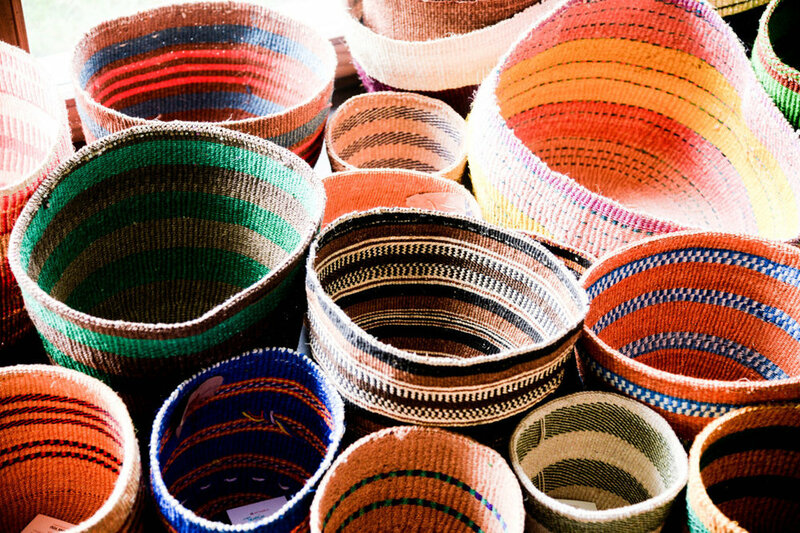 Hadithi baskets are made by weaver groups near Kasigau, South Eastern Kenya, in the villages of Makwasinyi, Buguta, Kiteghe, Rukanga, Jora, Bungule, Ngambenyi, Kisimenyi, Mwaktau, Bura (mkuyuni) and Mwatate. All these rural places are plagued by low rainfall and see many harvests fail. Over the years, selling the vyondo (baskets) has become an important income-generating activity that empowers the women in these communities. At the moment Hadithi works with over 400 weavers in the area. Making baskets is a very labour intensive art. All these ladies weave baskets with their self-twined and self-dyed sisal string. This sisal grows in the fields belonging to these women. They make use of both natural dyes and commercial dyes. The ‘Taita Traditional’ range comprises of baskets that are entirely woven with naturally dyed sisal – derived from tree barks, soil and flowers. All the bright colours are obtained using commercial permanent textile dyes. Every basket comes with its own photo tag identifying the individual it was made by; allowing you to meet the maker of your basket. On the front of the tag is a photograph of the woman the basket was woven by, and on the back is her name and some information about this group of weavers. A second tag explains how the purchase of a basket helps not only the basket weavers, but also how it contributes to the conservation of wildlife and forests in south-eastern Kenya. This Kenyan biological soap is handmade and 100% natural, using natural and essential oils with nice aroma. The soap does not contain any chemicals, they are made at a fair wage by local Kenyan women and all profits go to conservation projects for Wildlife in Kenya. The basket and wrapping is made by women of the Buguta Disabled group and the Neema women’s group. That is why these small hand soaps have a huge social impact.